Most of you know that when Google detects "spam" messages, Google flags them as "Spam," and automatically moves them into a separate Spam folder, bypassing your Inbox completely. You may have also noticed that Google displays an "exclamation point: in place of the sender's picture or avatar in the upper left-hand corner of the message as a visual flag. Now, Google has introduced a new security warning system for your Google at Work's Gmail Inbox, which is indicated by a “question mark” flag in place of the sender's picture or avatar in the upper left-hand corner of the message. The warning flag is used by Google when they are not certain a message is spam but is potentially malicious. These messages will still appear in the user's Inbox. 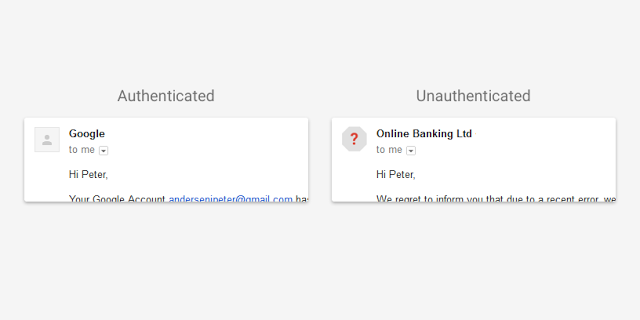 Google automatically uses two separate methods to attempt to authenticate a message's sender - Sender Policy Framework (SPF) or the DomainKeys Identified Mail (DKIM) standard. Note that messages marked with the question mark flag may still be from legitimate senders. The new “question mark” warning is available to users accessing their Gmail messages via a desktop/laptop computer or an Android mobile device, but is not yet available for iOS mobile devices. Get news like this delivered directly to your inbox. Thinking about moving your practice "to the cloud"? Already moved your practice to the cloud? Want to get more out of the Gmail (and other Google Apps) you're using in your practice? CLEseminars.com offers practical one-hour webinars that can help you answer some of the questions you might have. Presented by leading authorities on law office technology, law practice management, and legal ethics topics, Continuing Legal Education (CLE) credit is available for these webinars in nearly 20 states.